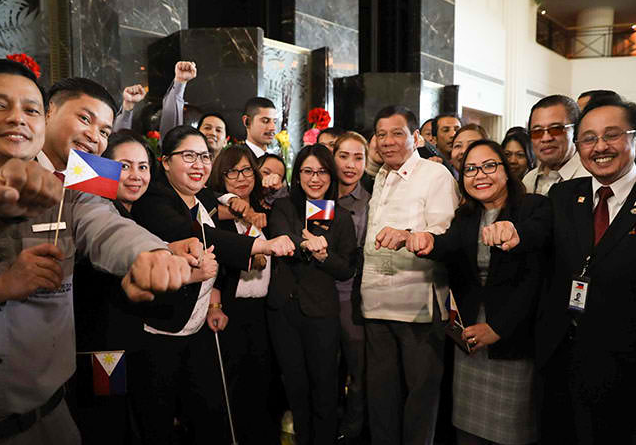 ISA TOWN, Bahrain, April 15 – President Rodrigo Duterte has announced that he would soon set up a department that would focus solely on the affairs of overseas Filipino workers (OFWs). “In a few months, you will have a Department of Overseas Filipino Workers,” he said as he faced an ecstatic crowd of about 4,000 OFWs in Bahrain at the Khalifa Sports City Stadium here. He said that with a separate OFW department, the time to process workers’ papers would be reduced from six weeks to three weeks. An OFW department would also help stamp out fly-by-night recruitment agencies, he added. The President likewise promised the OFWs that his six-year administration would be free from corruption, oppression and abusive officials, saying that he wants to solve the problem of corruption in the country to encourage OFWs to return home. “Ang OFW kasi, alam ko gusto ninyong mahinto na talaga ‘yung corruption para aangat ang bayan natin. (I know that OFWs want an end to corruption so our country would progress.) And maybe the next generation can really come home,” he said. He said OFWs can also help reform the country by being assertive and by shunning all acts of corruption, particularly at the immigration and customs bureaus. President Duterte meanwhile expressed his gratitude to the progressive Kingdom of Bahrain for welcoming Filipino workers into their country. “Bahrain has been good to you. I have talked to all officials, including His Majesty the King, and they only have nice words for you. Sabi nila wala silang reklamo sa inyo, mababait kayo, matiyaga, at wala silang masabi (They said they have no complaint about you, that you are kind and patient),” he said. The President received a very warm reception from members of the royal family, especially from His Majesty King Hamad bin Isa Al Khalifa. President Duterte also had an opportunity to meet His Royal Highness Prince Salman bin Hamad Al Khalifa and Prince Khalifa bin Salman Al Khalifa, Prime Minister of Bahrain, who led the send-off party for the visiting head of state. The Chief Executive proceeded to Qatar for the final leg of his three-country swing in the Middle East.